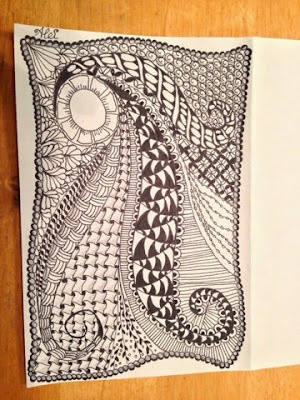 After my first zentangle, I visited my friend a few days later to have a look at her creations. Very beautiful zentangles she had already made. As she has had an artistic education, she gave me some tips and trics for drawing and composition. I often start with a flower, she said, and make a composition around it. So I also tryed to start my next zentangle with a flower. It's a simple one, but still I like the result. And I learned some other beautiful patterns I found on tanglepatterns.com and some zentangle books. My favorites are in the tangle you see here: Cadans, Jawz (very nice tangle ! ), Keeko, Sanibelle, Tortuca, Reticalated and Flutter.